Indirect Water Heaters | Quality Heating, Inc.
venting materials. They connect directly to an existing boiler. 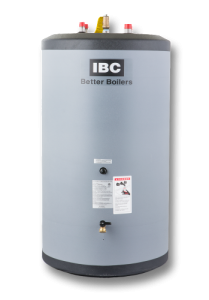 Quality sells Laars and IBC Indirect Water Heaters. Browse the selection below. 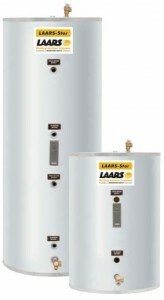 The ingenious Laars-Stor™ single wall was engineered to provide the lowest pressure drop, the highest hot water output and the highest amount of effective actual heat transfer area of any indirect fired water heater in the industry. The Laars-Stor2™ features a patented double-wall carbon steel heat exchanger coil coated with a glass-lining for corrosion resistance and long life. The Laars-Stor2™ supplies a first hour rating of 120 to 158 gallons per hour. The Laars-Stor™ SS utilizes a superior grade of stainless steel for the tank and the heat transfer coil. This construction is lightweight and also resists pitting while minimizing inter-granular and stress corrosion. The Laars-Stor™ SS models provide superior thermal conductivity for higher efficiency.